Northern Ireland's Lee Johnston says he has "fire in his belly" for the season ahead after signing with Ashcourt Racing for the Isle of Man TT. The 29-year-old Ulsterman will ride a BMW S1000RR in the Superbike and Superstock Senior races and a Yamaha YZF-R6 in the two Supersport classes. "I'm really looking forward to this year and I'm excited about the team we've put together," Johnston said. 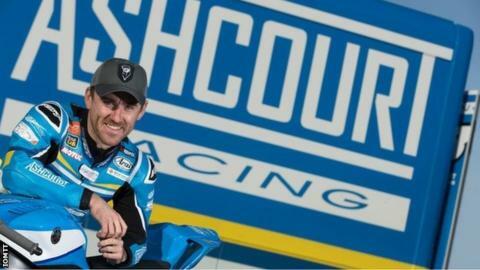 He will also compete at the North West 200 and Ulster Grand Prix. The three-time TT podium finisher added: "I've done more riding already this year than I'd done by the time I arrived at the TT last year. "I've won races and had podiums at the other International Road Races. "And whilst I'm not going to say I'm going to win, I'm riding against the same people at the TT so, with the new team that we now have, I'm confident we'll be able to give a good account of ourselves in all of the races in June. "I'm really excited about 2019 - it feels great to have the fire in my belly again and I'm in the best position I've been in for a long time. I'm aiming to be consistently on the podium in 2019." Johnston's best TT lap of 130.851mph was set in 2015 when he achieved his first Isle of Man podium.